Colne Valley Male Voice Choir is a charity. Its prime objects are to promote the study, practice and performance of music for male voices, and to promote music through concerts and other activities. Our charitable status requires us have a constitution and rules for conducting business. 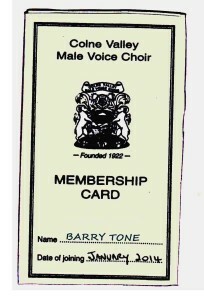 Each member gets a Membership Card when he joins the Choir. But it’s a fair guess that many Choir members won’t have that document readily to hand – so for the general information of website users – and to refresh the memories of members; Click here to see a copy of the Rules and Constitution.